Homemade apple pectin works! 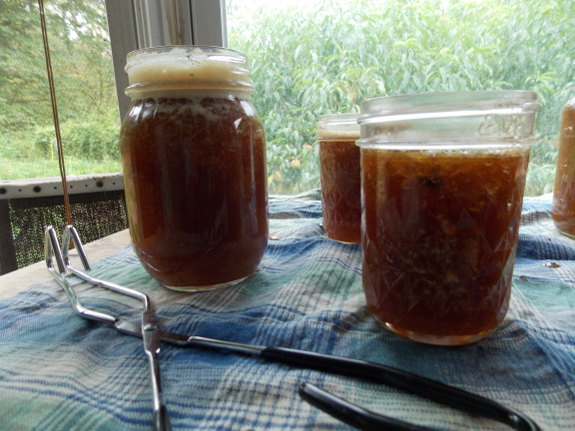 Which isn't to say that my jam-making experiments haven't included some growing pains over the last week. 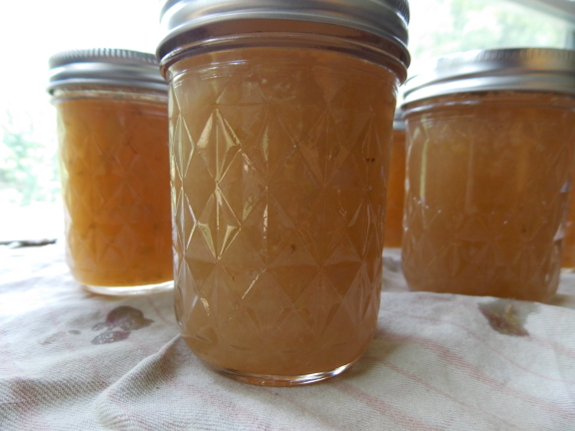 For example, my first try (shown above) didn't gel...so I renamed it "Peach Syrup" and pronounced it a success anyway. Too large of a recipe. Joy of Cooking recommends starting with no more than 4 cups of fruit, and I used 4 cups of peach puree plus 4 cups of apple-pectin juice for Jam 1.0. The trouble with big batches of jam is that jamming is very temperature-dependent, and the average home kitchen won't keep the contents of a large pot as evenly heated as the contents of a small pot. 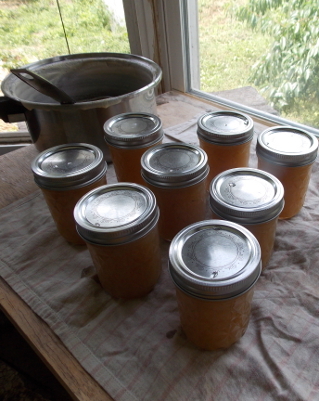 For Jam 2.0, I split my recipe into two pots, each of which held only four cups of liquid. Not enough cooking time. Joy of Cooking once again provided facts, telling me that it's necessary to cook your jam until it reaches 8 degrees Fahrenheit higher than the temperature at which water boils at your altitude. (So, I'm looking for a jam temperature of 217.7 here.) If your mother-in-law didn't give you a jelly thermometer like mine did (thanks, Rose Nell! 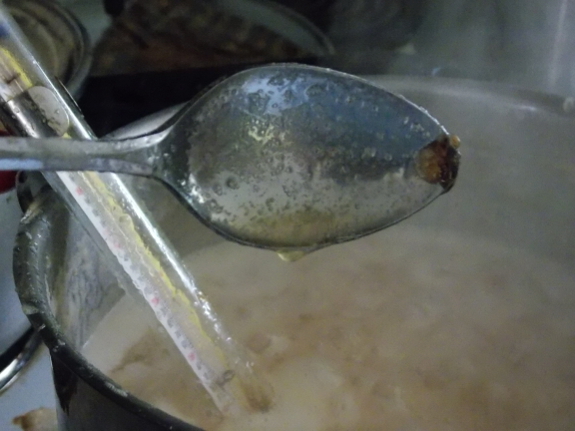 ), you can also estimate this temperature by letting the jam run off the side of your spoon --- when the drops merge together into a sheet, the jam is ready. Jam 2.0 went much better. I brought 2 cups of my apple-pectin juice to a boil, simmered for 5 minutes, then added 2 cups of pureed peach, 3 cups of sugar, and 2 tablespoons of lemon juice. Then I brought the mixture back to a boil and simmered for about fifteen minutes until the temperature seemed right. After 10 minutes in the hot-water-bath canner, the jars were full of jam that stayed put even when I turned the jars sideways! I'm not 100% happy with the results, but Jam 2.0 is definitely an improvement. I now see what various commenters meant when you said that this kind of jam has a "cooked taste." Sure enough, the bit of jam that didn't fit in the jars and that Mark and I tasted with dinner was more like candy than fruit (no wonder, since the cooked-down jam included half a cup of sugar per cup of finished jam!). And Jam 2.0 is more solid than I really needed, probably because I hadn't done the altitude calculations before writing this post and cooked my jam to 220 degrees instead of 218. But perhaps that's a sign I could cut back the sugar a bit more since this recipe gelled so well? Since it's so hard to tell when a white peach is perfectly ripe, I've been harvesting the drops each morning, which have been amounting to about a third of a bushel of peaches per day. I figure this amount will hold out until the end of the week, so I'll probably make at least one more try at jamming. 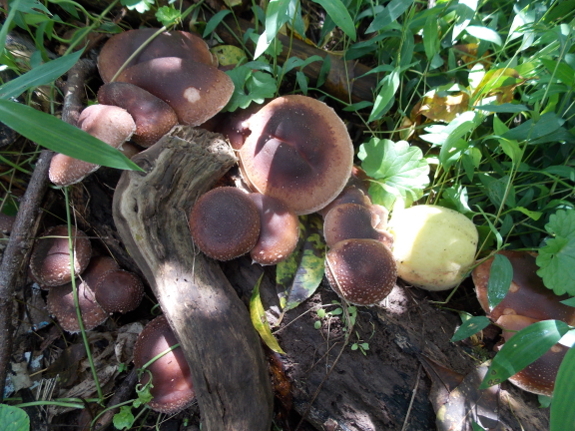 But first, we'll eat up these shiitakes that popped up in one of the logs I had resting in the peach tree's shade. The EZ Miser is Mark's newest chicken waterer, making clean water even simpler. Your puree and "fruit soup"
Sometimes it is good to have a sauce instead of jam, esp. on the side with deer meat, for ex. The way we like cranberry sauce with turkey...So, I'm hoping you can make a run of peach sauce or, as Scandinavians say, "fruit soup," something like the peach sauce you gave us on Sat. but actually more like Maggie's grape puree, with the consistency inbetween each of yours--but not sweetened, and, be careful not to fill the jars higher than an in. from the lid!